The first major of 2019 is fast approaching and we can’t wait to see all the action out of Augusta! The Masters is the only major to be played at the same venue each year. Making Augusta National a truly special place and the annual event an incredible way to kick off the golf season. As the best players in the world gear up to compete for the Green Jacket, we are offering two lucky entrants the opportunity to win either the Limited Edition TaylorMade Season Opener Staff Bag worth £399 (rrp £529) or an equally amazing £200 GolfOnline Gift Voucher. To be in for your chance to claim one of these incredible prizes, first you must correctly predict this year’s Masters winner. From today, 29th March, until 10th April 2019 choose your favourite player and enter the GolfOnline 2019 Masters Competition (NO PURCHASE REQUIRED). In the event more than two people correctly predict with 2019 Masters Champion, a random draw will be held to select this year’s winners. 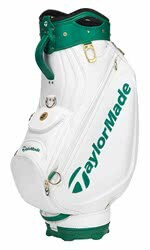 One will win the TaylorMade Staff Bag and the other will win the Gift Voucher, as drawn by GolfOnline. One entry per person (no purchase required). Entry closes on 10th April 2019 at 6pm (GMT). In case of multiple correct entries, two winners will randomly be drawn to receive the prize. The prizes cannot be exchanged for any other alternative or cash. On completing the entry form you will be opted in to receive our email newsletters and you will be entered for the prize draw. As the winner you agree to the use of your name and disclosure of county/country of residence and will cooperate with any other reasonable requests relating to any post-winning publicity. Winner will be informed via email and therefore we suggest you remain opted in until the end of the competition. GolfOnline reserves the right to withdraw/amend the competition without any prior notice. Please read through the our full Competition Rules before entering.